Weather December changed cooler for Victoria feels like going back 1990s pattern with more SW to SE change feel like go Queensland Holidays for swim. What are the thoughts on the strength and chances of the forecast storms overnight Saturday 01/12 into Sunday 02/12? 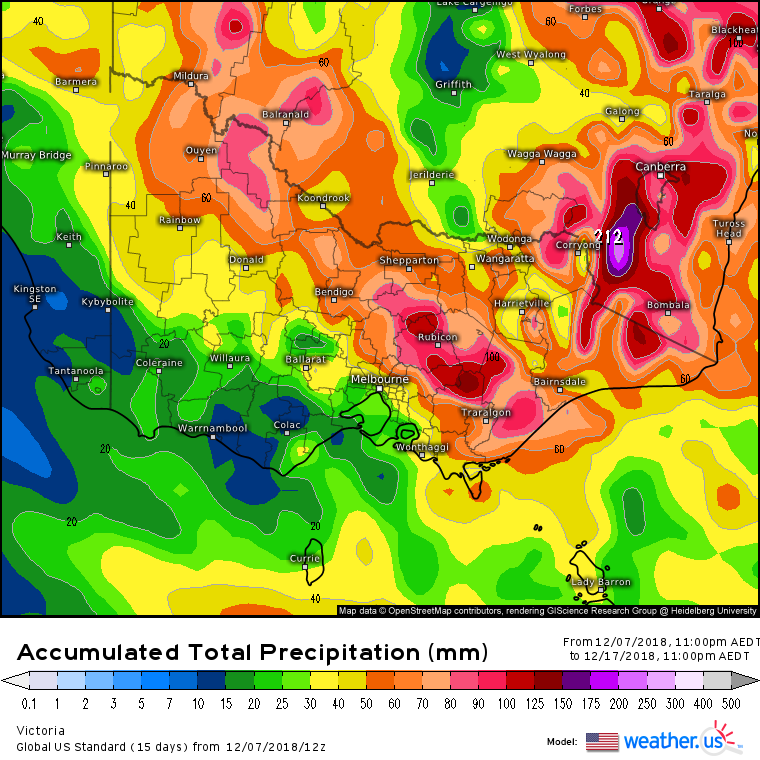 Balmz and Logansi , well stormcast shows nothing less 10mm as weaken once reach West Victoria early Sunday morning. Windy.com shows Thundery change to central Victoria about 8AM is light rain. 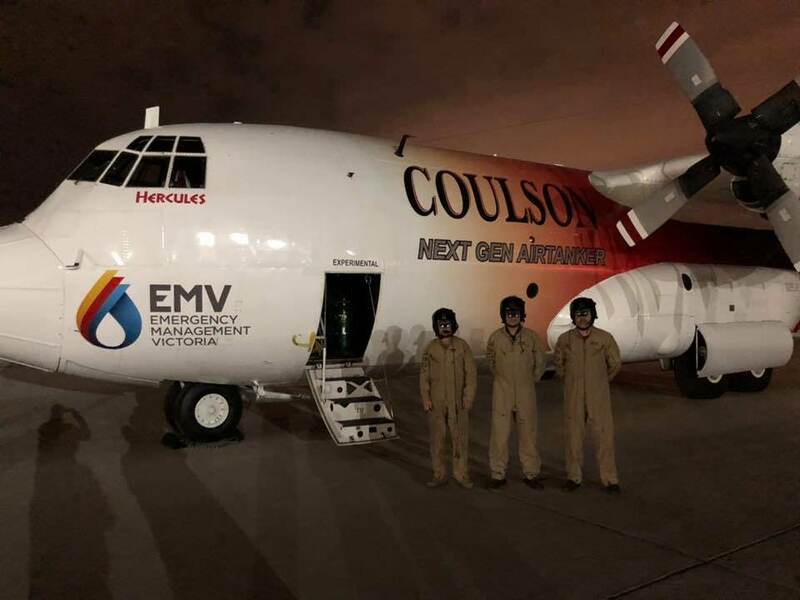 NSW already has its 3 Large Air Tankers in QLD, Night Trials are only approved in Victoria at the moment so sadly they won't be doing night fly up there, plane is to expand Victoria's fleet and expand to NSW over the next few years before doing nationwide. BOM have slightly upgraded N Gippy to a storm with circa 4-8mm tomorrow morning. Hope that comes off. 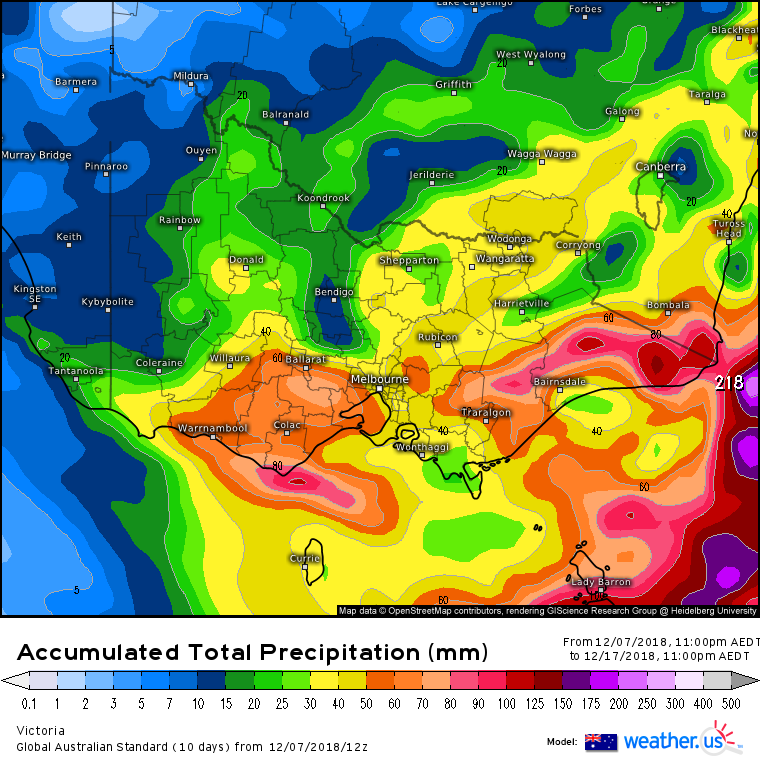 Next weekend looks like slow moving upper trough bring very heavy rain for West to Northern Country as up-to 60mm likely if chat don't downgrade. Still another week to go. Just an update to the possible big event next week, here are the most recent model runs total rainfall. Yep! Still a lot of uncertainty despite the rainfall totals looking similar they don't agree on how they get to them so still plenty that could change. 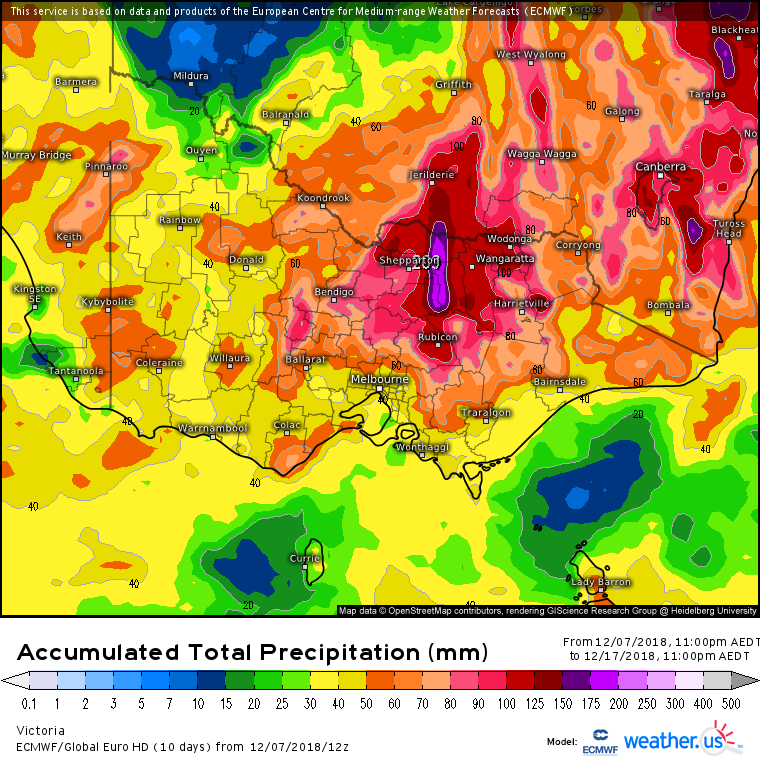 Logansi...I checked meteologix.com/au charts same very good cross fingers good rains. 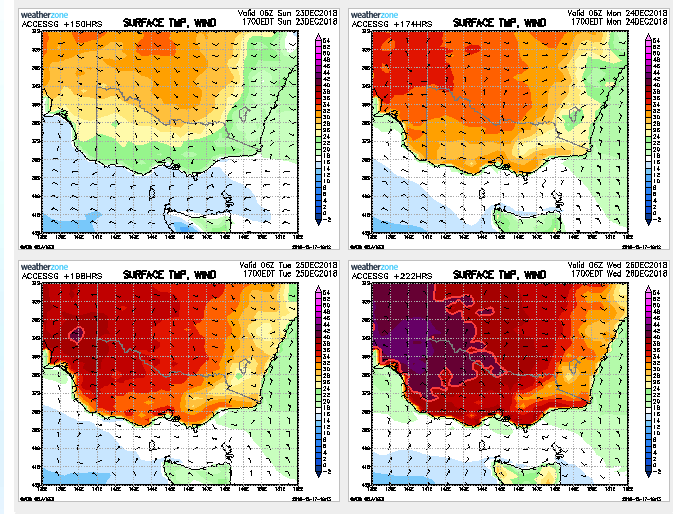 Hope second upper low trough in WA move to SE Australia repeat, too early yet. Through to jan I’d reckon for any fire threat. Time for a thread on this coming weeks ECL (or two?). Who's up to it!? One the low clears another inland low will form to the west and slip to the south, leading to a bit of heat before a cool change on Wednesday, maybe reaching the 40s in the north and low 30s in the south. But without a tropical connect will only delivery a few showers at best. Beyond that a high will move into the bight delivering southerly winds and stable conditions at least until next weekend. Substantial rain for extended period. Sure is looking hot over the Christmas period at the moment. Multiple days over 30 nearing 40 will reduce much of the benefit this recent rain has had. There is a massive amount of heat of the NW, Fitzroy Crossing is averaging 42.9 for December +3.9 above average, has broken its record twice this month and could do it again with 48 forecast on Thursday. 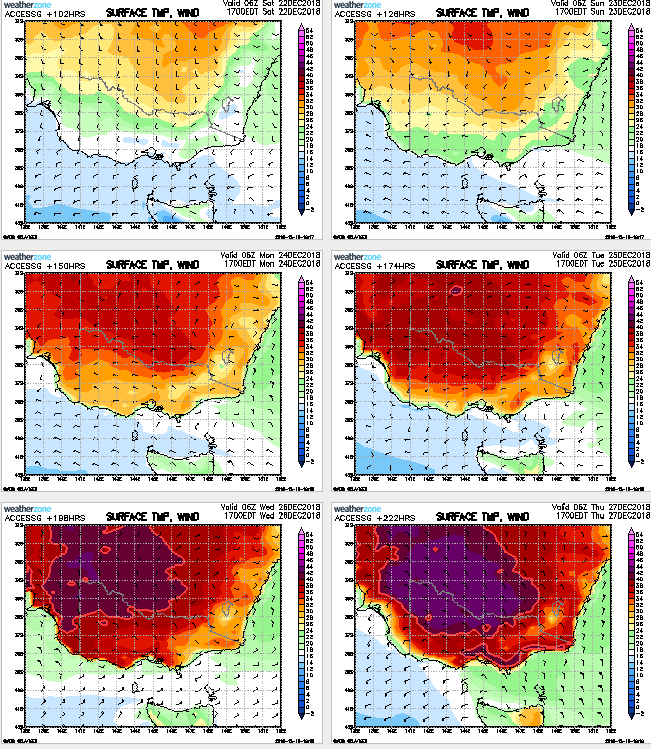 Still looking very hot for next week, significant portions of the state likely to see 2 40s in a row. Still no confidence in the models at this far out as to timing of the change likely sometime very late Thursday or Friday. Once we get more confidence on this i'll create a thread. 4 registered (Vinnie, ashestoashes, Mcbobbings, Barronriver), 61 Guests and 3 Spiders online.